Marty McFly (Michael J. Fox) promised us a lot of things for 2015. Marty, where are the flying cars, re-hydrating pizza and hover boards? Well, we're getting one futuristic thing. Time to rejoice because one of those famous "Back to the Future Part II" promises is coming true. Pepsi is officially launching Pepsi Perfect, which is essentially regular Pepsi in a fancy bottle that costs almost $21. In the movie, Marty arrives in the future on Oct. 21, 2015 and promptly orders a Pepsi, and to commemorate that historic date, Pepsi will actually be selling the product from the iconic 1989 film. "Pepsi fans asked and we heard them loud and clear," said Lou Arbetter, Senior Director of Marketing, in a statement. "The 'Back to the Future' trilogy was as big a moment in pop culture history then as it is now, 30 years later. We are excited to be part of this moment and to bring fans something only Pepsi could deliver - and there's no need to wait - the future is now!" 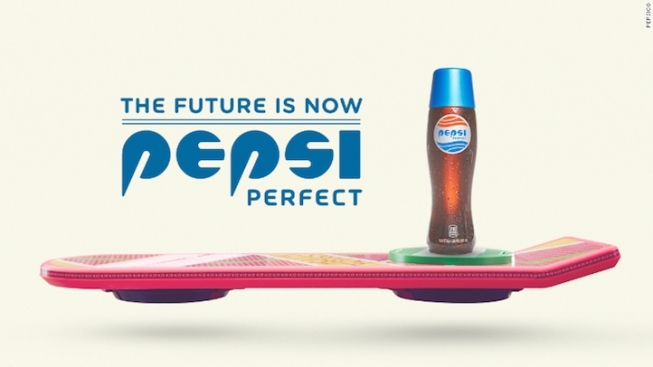 Pepsi Perfect will feature the sleek "Back to the Future Part II" bottle, and the formula will be made with real sugar. PepsiCo even released a commercial for the product launch full of flying cars, friendly robots and hoverboards. Pepsi says they will release only 6,500 bottles to purchase online for the price of $20.15, which means Pepsi Perfect will most definitely be a collector's item. The soda will even come in a special collectible case. There is a way to get a bottle of Pepsi Perfect early and for free. The first 200 people who come to Pepsi's New York Comic-Con booth each day dressed as Marty McFly will get their hands on one of these limited edition soft drinks. NYCC runs Oct. 8-11.